And another character. Phew! This one took a while, too many outline layers to get them all done alright. But turned out pretty good. Oh my, my paw is so tired. 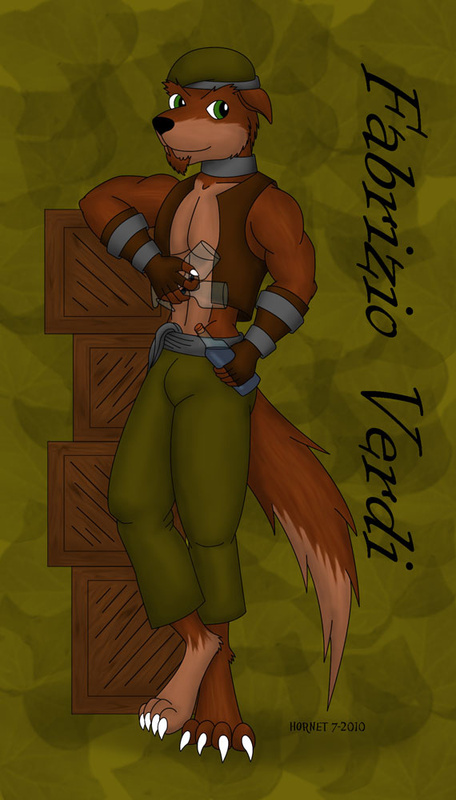 Bio: Fabrizio is the only son from a marriage of werewolves dedicated to collect art and own a wine cellar in central Italy. Since young, he grew up surrounded by fine arts, and he got to know about wines as well. Even tough being born a werewolf, Fabrizio has always struggled with controlling his wolf side. His parents were unable to help him, so when they met Zelcius during some business, they came into an agreement to let him and his pack work with Fabrizio to get to control himself. A theory why he has these problems might be that Fabrizio is more powerful than an average werewolf. A fact to add this theory is that he is son of both werewolf parents, something not unusual but it can help the child to be more powerful. Fabrizio gets along pretty good with Crystal, Amber, Patrick and Derek. He is a womanizer with a really good poetic tongue. He likes to praise women, no matter anything like age, appearance, origins, anything matters to him as long as he scores (not sexually) with them. He also enjoys arts, he can spend hours in a museum trying to learn the most from every piece he finds, and tries to find proper word to get people interested in them. This leads to one of the issues others find on him: he talks a lot. However, he doesn't mind and knows when to shut up if necessary.